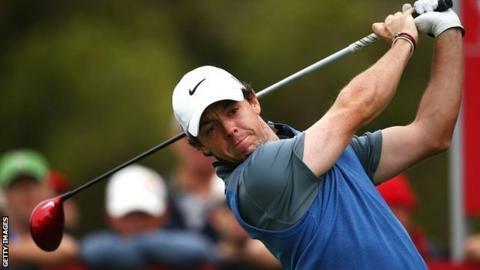 Rory McIlroy carded nine birdies in a round of 65 to move two shots behind leader Adam Scott after two rounds of the Australian Open at Royal Sydney. Seven back after day one, McIlroy, yet to win this year, benefitted from more favourable early conditions and reached 10 under, taking only 25 putts. Scott endured blustery, wet afternoon weather and mixed seven birdies with a double bogey and three bogeys in a 70. Australian left-hander Richard Green had a hole-in-one and is in third spot. Scott's course record 62 had put him three strokes ahead on the opening day and he extended that advantage to five when he birdied the first and then holed a 50-yard chip shot for a birdie at the third. The world number two, who will finish at the top of the Australasian Tour rankings regardless of what transpires in the final two rounds, slipped behind McIlroy after dropping three shots in two holes, but recovered to finish on 12 under for the tournament. "It was a tough afternoon with plenty of good stuff in there but then I made a few mistakes in the tricky conditions. Overall it was pretty good and given how difficult it was, I was pleased I held it together pretty well," he said. "It was a day where all you could do was just hang on and try and hit as many good shots as possible. "And while I managed a good few birdies, if you were slightly off the bogeys were easy to come by." In an intriguing third-round showdown he will be paired with McIlroy, who said of his round: "As seven-unders go, I think it was a pretty comfortable one. I don't think I did anything really spectacular out there. "I played well, putted much better today than I did yesterday too, so that was a big positive. It feels good and I'm in a great position going into the weekend." It was the fourth time the 24-year-old Northern Irishman has posted a 65 this year, with a 64 in August's FedEx Cup opening Deutsche Bank Championship in Boston his lowest competitive round of 2013. His best finish is second at the Texas Open in April where he was two shots behind winner Martin Laird, but in recent weeks he has shown form more reminiscent of last year when he won five titles. McIlroy was joint sixth in the WGC Champions event in Shanghai and tied for fifth at the final European Tour event of the season, the Tour Championship in Dubai. Peter Senior, the 54-year-old Australian who became the oldest winner of the Australian Open last year, had two double bogeys in an 81 and missed the cut. Meanwhile, American Kevin Streelman, who won his first PGA title at the Tampa Bay Championship in March, withdrew after just four holes because of a problem with his eye. He was taken to nearby St. Vincent's Hospital where he was informed he had a scratch on his cornea and he is awaiting advice as to whether he can travel home or, as he had intended, play in next week's Nedbank Challenge in South Africa.